THE Durant company of California is a division of Durant Motors, Inc., one of the largest automobile manufacturers in the world. Its function as a part of this great organization is the building and distribution of Durant motor cars and trucks for the western United States and for the Orient. Durant Motors, Inc. is a world-wide organization. It has factories in several foreign lands and representation in every important market in the world. Its great strength enables it to maintain a corps of research and laboratory experts whose work keeps Durant cars constantly in the forefront of the industry's progress. Its buying power enables it to purchase on terms not possible for many other automobile manufacturers. Its financial sturdiness makes possible the acquisition of its own raw material sources and its own transmission, gear, glass and other plants. The large economies effected by these means make possible the tremendous values represented in Durant Fours and Durant Sixes. This great company owns or has corporate affiliations with Durant Motor Company of New Jersey, Elizabeth, N. J.;- Durant Motor Company of Michigan, Lansing, Mich.; Durant Motor Company of California, Oakland, Calif.; Durant Motors of Canada, Ltd., Toronto, Ontario; HayesHunt Body Corporation, Elizabeth, N. J.; New Process Gear Company, Syracuse, N. Y.; Adams Axle Company, Syracuse, N. Y., and Findley, Ohio; Warner Gear Corporation, Muncie, Ind. ; American Plate Glass Company, Kane, Pa., and Locomobile Company of America, Bridgeport, Conn. The combined assets of Durant Motors, Inc., and affiliated companies aggregate more than $100,000,000. The axle, transmission, differential and steering gear plants owned by the company are valued at more than $10,000,000. Except plants owned by General Motors and Ford, the New Process Gear Company is the largest gear producing concern in the United States. The American Plate Glass Company is exceeded in size by only four plate glass companies in the entire world. Durant Motors, Inc., was founded in January, 1921, by W. C. Durant, one of the country's most brilliant executives. W. C. Durant is a pioneer in motor transportation. He has played an important part in developing the automotive industry from a comparative infant to a veritable giant. He was the organizer of General Motors and is credited with having brought about the outstanding success of such automobiles as Buick, Cadillac, Chevrolet, Oldsmobile and Oakland. He has also created or fostered a number of other important enterprises, among them Frigidaire, a General Motors product. In January, 1929, W. C. Durant relinquished active management of Durant Motors, Inc., to a group of executives who already had been responsible for one of the outstanding automotive successes of all time-Dodge Brothers motor cars and trucks. A. I. Philp, chairman of the board of directors. Mr. Philp formerly general sales manager of Studebaker Corporation and sales manager of Dodge. Mr. Haynes until recently was president and chairman of the board of directors of Dodge Brothers. Ralph A. Vail, vice-president in charge of engineering and production. Mr. Vail was director of engineering and production for Dodge Brothers. John A. Nichols, secretary - treasurer. Mr. Nichols was the vice- president in charge of sales for Dodge Brothers. The change in executives in Durant Motors, Inc., however, did not extend into the California company, where Norman De Vaux, one of the leading figures of western automotive industry for more than a quarter of a century past, continues as active head, thus assuring that the same genius which has brought about Durant's phenomenal success in the west would continue to be manifested in the company's operations. Mr. De Vaux' record of brilliant success, his broad policies and sound business principles have long made him known as one of the outstanding industrial leaders of the country. The twenty-six years of accomplishment which stand behind this executive are based on a firm foundation of experience. Mr. De Vaux started his automotive career as a mechanic. By energy, loyalty and application he won his way up through the ranks of motordom. He was salesman, dealer and distributor and, in 1916, entered the manufacturing field. It is significant that all his associations have been with high-quality automobiles. He began by associating himself with Cadillac in 1902. He was among the first to introduce the Buick to the Pacific coast and later he was one of the first to offer a western clientele the Reo. Mr. De Vaux' association with W. C. Durant dates back many years, though it first came to public attention in 1916, when he joined the board of General Motors in establishing the western Chevrolet factory in Oakland. He served as president and general manager of the western Chevrolet organization until 1922, when he resigned to again join Durant in giving the Pacific coast its second automobile factory. When the Star car appeared on the automotive market, De Vaux again became affiliated with Durant in that enterprise. As vice-president and general manager of the Star organization on the Pacific coast he displayed an executive ability which put the Star in the dominant group in the west within a year. Automotive annals have few records to equal this. The Durant Motor Company of California absorbed the Star Motor Company of California in 1924. De Vaux was placed in entire charge of Durant operations in the west, a position in which he has been directly responsible for the overwhelming success of Durant cars and the growth and efficiency of the Durant organization in this territory. The other executives of the Durant Motor Company of California are men of long experience, recognized as capable and efficient officials. George R. Scott, vice president and assistant general manager in charge of production. George R. Morris, sales manager. E. S. Jones, assistant sales manager. J. H. Conway, manager parts and service division. F. W. Vrooman, mechanical engineer. H. T. Kuhlman, planning engineer. Earl C. Allender, traffic manager. The Durant Motor Company of California is one of the important concerns of the Pacfic coast. This company has a capital of $3,000,000 and no bonded indebtedness or outstanding obligations. Its financial basis is sound. It is amply able to immediately install each improvement in manufacturing processes developed by the automotive industry. It always has stood and always will stand firmly behind its products and the men who distribute them. This company was incorporated in 1921 under the laws of California for the purpose of building and selling Durant cars and trucks in California, Washington, Idaho, Montana, Oregon, Nevada, Utah, Arizona and the western portion of Wyoming. It has the exclusive right to distribute these products in Hawaii, the Philippine Islands, and Dutch East Indies, Japan, Manchuria and China. 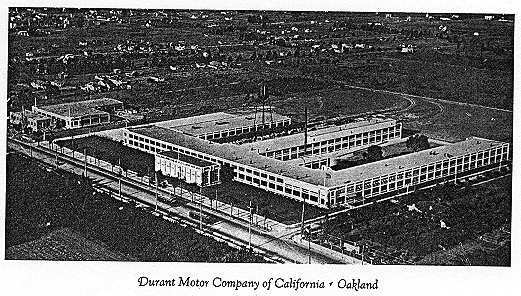 The factory of the Durant Motor Company of California is located in Oakland and is one of the largest automotive activities of the west. Both the manufacturing facilities and the distributing organization have been expanded rapidly. Originally capable of completing but 50 cars a day, the factory has been enlarged until it now has an output of 3,500 cars each month. At the same time additions have been made to the distributing organization until it now includes more than 600 distributors and dealers. The factory and offices occupy a 30-acre site, the buildings now covering an area in excess of 350,000 square feet. There are five buildings, the main factory having three large wings. Most of the buildings are two stories in height. Between 700 and 900 employees are carried on the payrolls. The system of manufacturing used here is that known as "the production line method," which was invented by and finds its highest application in the automotive industry. Under this system main units of the car travel down a line of work, men, each group of whom adds some item or performs some operation, until eventually all units are combined to form the finished product. A development of the system is the 11 sub-assembly line" on which, in precisely similar manner, minor groups of parts are assembled, finally being added to the main unit at an appropriate place on the general production line. The system has been very highly developed in the Durant factory and is an important factor in enabling the company to produce high-class cars and trucks more cheaply than many other manufacturer, a situation which is reflected in the low selling prices of Durant products. This system also tends to develop specialists who can perform particular manufacturing operations better and more rapidly than general mechanics, thus again attaining economy and giving the buyer greater value for his investment. Great use is made in the Durant factory of special dies and jigs. This speeds up manufacture and assures uniformity and interchangeability of all similar parts. This again facilitates assembly and reduces costs. It also guarantees to the car owner that every part of his car conforms to specific high standards, for no makeshift methods can be used in manufacturing or assembling jig made parts; they must be right or they will not fit into the general assembly. Throughout the factory the most highly developed and efficient manufacturing processes are employed-pneumatic machines set cold rivets, air hammers are used for hot riveting, compressed air hoists, compressed air wrenches, electric screwdrivers, compressed air paint and lacquer sprays and many other like adjuncts to efficient manufacturing are used. These not only do the work faster but better than it could be done by hand. From start to finish of the manufacturing process, from raw material to completed car, a corps of inspectors, each a specialist in his line, checks everything. No material, no part, no item of workmanship can pass these men unless it conforms to rigid standards. This virtually eliminates structural failures and faulty performance from all Durants and is the real source of much of the satisfaction expressed by Durant owners. In the Oakland factory bodies are built complete, members received from stamping plants are riveted together to form frames and the finished cars are assembled, but transmissions, steering gears, axles and some other parts are obtained, ready for installation, from other Durant plants. A great deal of both raw material and finished parts are obtained from western sources. For instance, lumber for the running boards comes from Oregon, cotton for stuffing the upholstery comes from California sources and springs are obtained from a California plant. Thus Durant success adds to the prosperity of the whole west. The personnel which manufactures these cars is of a high order. Every effort is made to employ the best mechanics and, once employed, the men are well treated. The consequence is that few leave the company and a generally high average of skill and experience is maintained. The working conditions are excellent. The factory buildings are modern, clean, comfortable and exceptionally well lighted. This encourages the workmen to do good work and makes it easy for them to see errors and imperfections. High efficiency and excellent torque curve, extreme flexibility, simplicity of design and rugged construction characterize the Red Seal Continental six cylinder engine used in the Durant Sixty. These engineering terms, translated for lay use, mean low gasoline consumption, great power under heavy loads, rapid getaway and a minimum repair bill even after years of use. This is an L-head, high compression engine of the high turbulence type. Its six cylinders give it smoothness of operation. Its high compression feature makes for power and for economy of operation. A high degree of turbulence attending the injection of the charge into the cylinder means perfectly vaporized gasoline thoroughly mixed with air. This high turbulence is brought about by special design in the intake manifolds, careful location of the intake valve and some other highly technical points which result in complete combustion, full power for every drop of gasoline burned, better economy and freedom from oil dilution. The L-head type of motor, on the basis of present day research, develops the most power per unit of fuel at speeds compatible with automobile operation. While some very good engineers prefer other types of engines for higher speeds none deny that the L-head type is peculiarly fitted to pulling its full power at the speeds used in automobiles today. The efficiency of this motor is further enhanced by use of carefully honed cylinders and Nelson Bohnahite Invar-strut pistons. By these means unusually dose fits are obtained between piston and cylinder walls, virtually eliminating leakage of the power-producing gases past the piston.